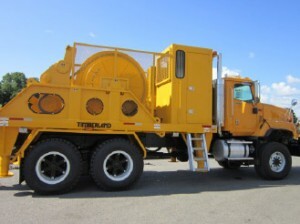 Timberland provided a full suite of conductor stringing equipment to Taiwan Power Corp., including three sets of: 15-ton drum pullers, 12-ton 4-bundle tensioners, 4 drum pilot line winders and 34 powered reel stands. The equipment required custom engineering to be installed on trucks suitable for Taiwan’s road and terrain conditions, and to ensure that it can sustain the extreme climate conditions of Taiwan’s typhoon season. The project was completed on-time and Taiwan Power is enjoying the benefits of the high speed performance ratings and excellent reliability.